Filling in a new calendar is also a chance to look back on the past year. All the things you did, the people you met and stuff that happened. 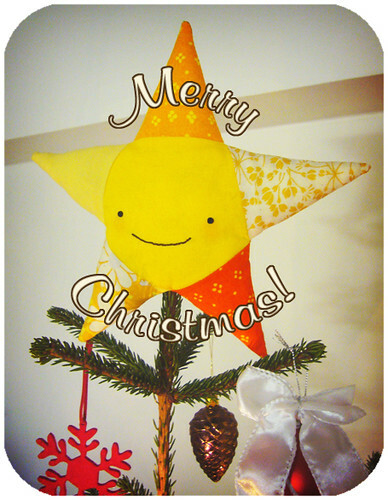 This ending year I made lots of new Rag Pets, started this blog, and I took part in the Plush You show, which was something I've never done before and a great experience, and I took part in Give Away Day, which was a super fun thing to do. I also attended three weddings, spent a lovely weekend in Stockholm, visited family and had family visit us and celebrated various birthdays and anniversaries. I'm amazed every time by how much one year can hold when I look back on it! This little blog has had 5550 visitors since it was set up about six months back last summer (Thank you ever so much everyone! ), and I hope there'll be lots more of you this coming year. I also hope to make many, many, many more Rag Pets and to finally get my shop up and running in 2009! I also hope that the coming year will be filled with happiness and joy and sunshine and all the little things that make life great. My New Year's resolutions are to get that darn shop up, to spend more time with friends, to smile more and to live more. I wish you all a wonderful, amazing and happy year! I've had such a lovely December. I put up my Christmas lights on the 1st and I've been listening to Christmas music all month, baked yummy gingerbread cookies & Christmas tarts and I've had a lot of fun puttering about with presents and decorations and things too. I think I even managed to infect some Christmas spirit into J. as well! He can be a tiny bit of a Grinch come yule time, but there's a lot of jolliness under all that too. To top it all off, it snowed today! This made me even jollier, as we haven't had a white Christmas in such a long time. There isn't more than a dusting of snow on the ground, but it's still heaps better than the grey drabness we've been suffering through most of this winter. Meet Noëlle and her teddy bear, Bear. 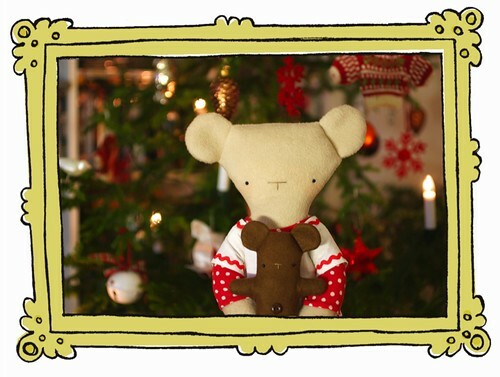 Noëlle loves Christmas decorations, gingerbread cookies and pretty twinkly lights. She's really good at wrapping presents and can wrap even the most unwieldy things with ease. Noëlle doesn't go anywhere without her dear Bear, who she got as a Christmas present years ago. 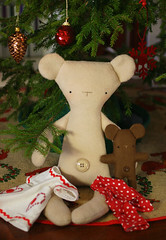 Noëlle is made out of soft toffee coloured wool & she's filled with rags and a bit of organic cotton batting. Her eyes are tiny little buttons and her nose is embroidered. Noëlle has sweet blushy cheeks and a shiny plastic button for a belly button. 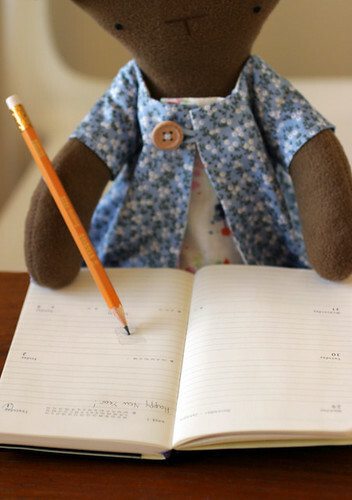 Bear is made out of felt and filled with organic cotton batting. 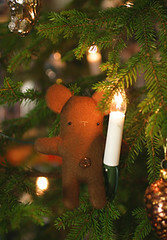 He has little button eyes and an embroidered nose just like Noëlle, and a little brown button for a belly button. 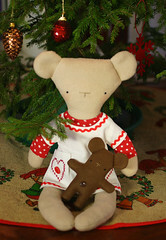 Noëlle is wearing a white cotton dress that has embroidery and decorative buttons on the pockets (that are big enough to accommodate Bear) and red ric-rac on the collar, cuffs and hem. The dress fastens in the back with a snap. 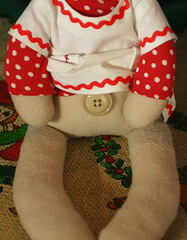 Under the dress she has a red and white polka dotted long sleeved T-shirt that fastens in the back with velcro. J. mentioned that Twitter might be a nice way of sharing my life & work and connecting with others on the net and he prodded me to take up twittering. So, I find myself there again after creating an account (I was first enticed by the whole avian theme) last year, posting one tweet and then promptly forgetting about it. A big, gargantuan thank you to everyone for all your comments! I'm amazed, astonished and astounded by the amount of comments my Give-Away Day entry gathered; I was expecting to get about 20 or 30 comments at the most, and it ended up at over ten times that! 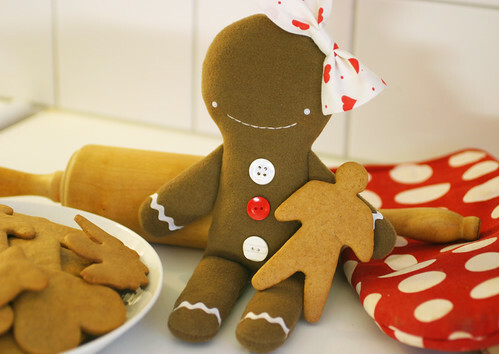 This is Ginger the rag-gingerbread girl. She's been freshly baked out of gingerbread brown wool and she's stuffed with rags and organic cotton batting. She has little button eyes, an embroidered mouth and blushy cheeks. Her pretty bow is made from an old pillowcase and her buttons are all vintage. 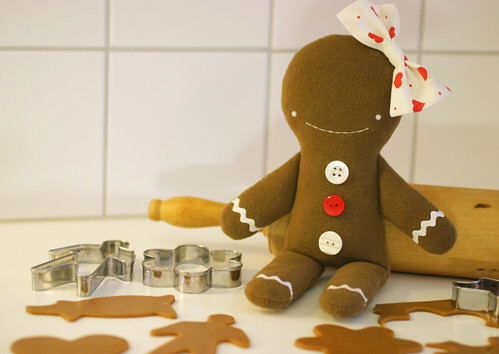 Ginger has white ric-rac icing on her arms and legs and she smells faintly of gingerbread. Be sure to check out all the other crafters who are taking part in Give-Away Day too! There's a long, long list of all the participants over at the Sew, Mama, Sew blog. My Christmas plans are pretty much the same as they are every year. 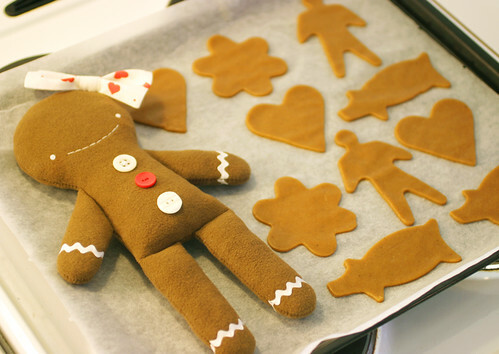 I hung my Christmas lights up on Monday and today I baked gingerbread cookies. We're getting a real Christmas tree this year and I'm super excited about that! My old, small plastic tree is a bit pathetic and of course, it doesn't give a lovely Christmassy scent like a real tree does. I can even get a real star for the top now! We'll be going over to my parents' for Christmas Eve to have dinner. We'll be getting our own Christmas ham too from J's parents and I'm going to bake some Christmas tarts later on as well.